Do your fly-fishing dreams have you in Montana’s Big Sky Country standing knee deep in one of the worlds finest trout fisheries? Where monster Brown trout gorge themselves on stone flies and grasshoppers. Powerful energetic Rainbow trout rise to the rivers surface to take caddis or mayflies. Let Greco’s On The Fly fishing charter guide you through beautiful rivers such as: The Madison, Yellowstone, Missouri, Ruby, Gallatin and Jefferson to give you an experience like no other. Trip rates are listed at the bottom of the page. "I just wanted to thank you again for the awesome time Mike and I had on the Madison. We caught more browns and ‘bows than either of us had anticipated. And we’d have likely caught three times as many if we saw half the fish you spotted...and had better strike timing. ...thank you for keeping the fly patterns flowing, the drifts long... Three days and 46 miles of drifting passed by too quickly. You made the trip completely enjoyable, and we’ll be recommending..."
"I've fished with Brett for the last few years, a couple times each year, and could not have had a better experience. Brett is not only a great guide but also a great guy to spend a few long day on the water with. Highly recommend!" -Bo V.
"Coming from New Jersey I didn’t know what to expect as far as fly-fishing in Montana. A friend of mine and I spent three days in early September fly-fishing over 45 miles of the Madison River. We both caught more than either of us had imagined. Brett’s knowledge and expertise in fly-fishing the Madison were first rate. He did an excellent job knowing great spots guaranteed to catch trout. Thanks to Brett, our trip was a huge success. I would highly recommend anyone interested in fly fishing in Montana and more specifically the Madison." The Madison River is a headwater tributary of the Missouri River, approximately 183 miles long, in Wyoming and Montana. Its confluence with the Jefferson and Gallatin rivers near Three Forks, Montana forms the Missouri River. From Montana to Florida throughout the year! The beautiful town of Ennis Montana is one of Montana’s premier fly fishing destinations! With many of Montana’s best rivers within a short drive from Ennis Montana the traveling fly fisherman has access to a seemingly endless supply of pristine trout rich rivers. The Madison, Yellowstone, Ruby, Big Hole, Beaverhead, Jefferson, and Missouri River are all within a short distance from the quaint western town of Ennis Montana. 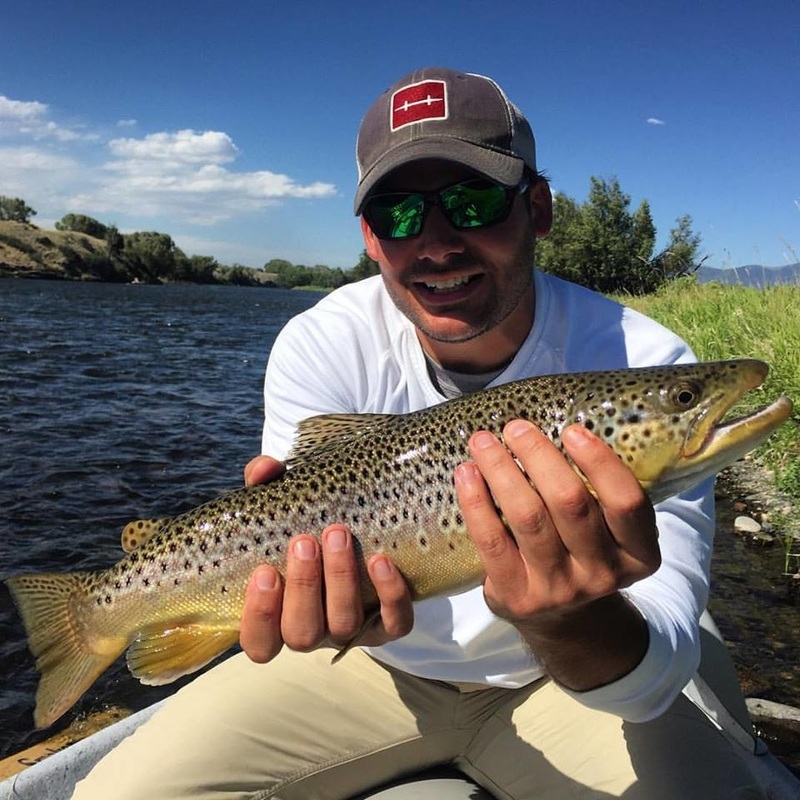 Captain Brett Greco and his crew of expert fly fishing guides will cater to your angling abilities and desires to give you the Ennis Montana fly fishing guided fishing charter of a lifetime! When you book a guided fishing trip with Greco’s on the Fly fishing charters they guarantee to provide you with the very best fishing guides Ennis has to offer. With a guide staff full of knowledge, expertise, and patients Greco’s on the Fly fishing charters will provide you with the very best of guided fly fishing trips Ennis Montana has to offer. If your looking to hire a fly fishing guide on the Madison River in Montana, look no further. Greco’s on the Fly fishing charters has the very best fly fishing guides on the Madison River in Montana. Capt. Brett Greco has been a fly fishing guide on the Madison River for the past sixteen years and knows the river intimately. Capt. Brett Greco and his crew of patient, knowledgeable guides will show you the very best fishing the Madison River has to offer. Whether your looking to see a large portion of the Madison River in a float trip or you want to really get to know a smaller section of river in a walk and wade trip. Greco’s on the Fly fishing charters will set you up with a fly fishing guide on the Madison River in Ennis, MT or surrounding area, that will work hard, patiently, and energetically to give you a fishing experience you wont soon forget. Your Madison River fishing guide can help get you dialed in on where to fish and what flies to use. The Madison River provides some of the best trout fishing Ennis has to offer. From its beginnings in Yellowstone National Park where the Firehole and Gibbon rivers converge to where it meets the Gallatin and Jefferson rivers in Three Forks Montana to create the mighty Missouri river. The Madison river offers shallow rocky riffles, deep pools, and braided channels full of a wide variety of insects providing prolific hatches and fantastic dry-fly fishing opportunities. Montana’s Yellowstone River is the largest free flowing river in the lower 48 states, and one of the great trout streams of the world. Montana’s Yellowstone River offers excellent trout fishing from its origins deep inside Yellowstone National Park through the town of Big Timber Montana. A stretch of nearly two hundred miles of pristine free flowing trout river. A guided fly fishing trip on Montana’s Yellowstone River is the best way to experience all it has to offer. The Yellowstone is a large river varying in width from 75 to 300 feet. Only in low water can one wade across this mighty river. Hiring a fly fishing guide through Greco’s on the Fly fishing charters is the very best way to experience all Montana’s Yellowstone River has to offer. The most scenic portion of Montana’s Yellowstone River is through the “Paradise Valley” where one can find a pleasant mix of Brown, Rainbow, and Cutthrout trout. A guided fly fishing trip on Montana’s Yellowstone River with Greco’s on the Fly fishing charters is the very best way to enjoy this legendary river. Hiring a Montana fishing guide through Greco’s on the Fly is without a doubt the best way to experience all the legendary trout fishing Montana has to offer. Whether float fishing or wade fishing one of Montana’s famed trout fisheries Greco’s on the Fly will provide you with the most memorable Montana fishing service around! *Prices per 1 or 2 anglers. *$100 deposit is required for all charters. *All charter prices are subject to change.